Amazingly, he says Focal Point has been an exhibitor since 1997. AMID all the tongue-clucking about the Heidi Fleiss booth at BEA[BookExpo America 2002 in New York], a far more controversial exhibitor seems to have passed through the show undetected. I guess that slipped through before "the circular" arrived from ADL headquarters. The FP stand (total cost with advert: some $10,000) was sandwiched handsomely between the Encyclopedia Britannica stand and a Digital Mapping company. People came in from all over the BookExpo, having seen others carrying the poster: schoolteachers asked for several for schoolroom walls, history buffs, students, and journalists asked for them, and a man from "Newsroom One", on TV, asked for one for his newsroom wall. As for the latest edition of Hitler's War not explaining what is new, if Mr Zeitchik had turned to the Introduction he would have found a section at the end, What's new in the Millennium Edition. The dustjacket carries the same information. The book is available through amazon.com, and Mr Mark Levine of Barnes & Noble sent a flunky over to the FP stand, uninvited, to collect copies of both that book and Goebbels. Mastermind of the Third Reich. David Irving, the well-known Holocaust denier who recently lost a libel suit in the U.K., exhibited on the show's lower level under the name of the publisher he runs, Focal Point Publications. Irving's company handed out posters of Hitler flanked by two members of the Luftwaffe [sic. German army] and promoted the new edition of his book Hitler's War. The title has been out for twenty-five years, and the Focal Point site does not explain how the new version has been "updated and revised." Neither Amazon, B&N.com nor Amazon.co.uk offer the book for sale. In the BEA guide, Focal Point is listed as producing "primarily WWII histories and biographies of its leaders including Churchill, Hitler, Goebbels, Goering, Hess and Rommel, written by famous British author David Irving." We're not sure how we missed it, but on page nine of the directory there sits a full-page ad for Focal Point. In it, a picture of Hitler and Goebbels [sic. Keitel and Halder] standing in a bookstore accompanies the line "Look Who's Back in Your Local Bookstore," leaving ambiguous the question of whether the who refers to the Nazis or Irving. It explains that Hitler's War has been revised and that Churchill's War, "the mighty second volume of Irving's best-selling biography" is also now available. Show manager Greg Topalian said he does not see it as the convention's job to discriminate on the basis of a book or a publisher's ideology. "Our position has always been that freedom of speech should reign. You can take exception with a lot of the things on the show floor. 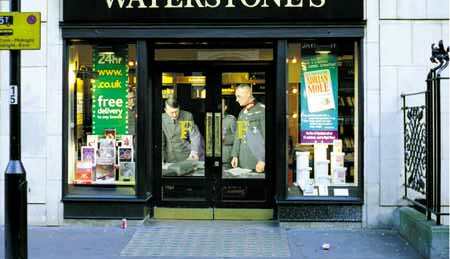 It's up to the booksellers how they want to deal with it." Amazingly, he says Focal Point has been an exhibitor since 1997. Irving has been involved in a number of lawsuits over the last few years. In the most high-profile case, he sued academic and Penguin author Deborah Lipstadt for libel in the U.K., where the threshold for proving such a violation is lower. He lost the case, and now owes Penguin several million pounds in legal fees. The booth was located near the DC Comics exhibition area and was also close to several children's publishers. Topalian said that the convention's space draw is based entirely on seniority and that the only time show management might intervene would be for reasons of sensitivity -- for instance, it might keep a religious publisher separate from a publisher of explicit materials. He added that while the lower level contained a numbers of children's houses, it was not designated as a kids-only section. Despite the potential for controversy, Topalian said that the presence of Irving's company at the show barely caused a ripple. "Actually, we got a lot more comments about Heidi Fleiss," he said.